Daniel began playing football at 11, and never looked back. Tough and versatile, he played offense, defense, and special teams, rarely getting off the field. He loved it, and he was good. Determined, he did all that was needed: kept in shape, practiced hard, kept up his grades, and never complained. No, he never complained and never told anyone when he was hurt until August 24, 2009. On August 24, 2009, our son Daniel made starting linebacker for Cypress Bay High School’s JV football team. It was a victory for him and his first major step in actualizing his desire to play in college. It was also his last day ever playing football. At 5’9”, 160 pounds, he wasn’t big, but he was tough and fearless, and he thought it was the way to be, to one day play for his dream team, the University of Miami Hurricanes. No pain, no gain. “Coach, I can’t see,” Daniel finally confessed. Coaches noted he was sluggish, not responsive during play and the reason was obvious when he finally went to them. The athletic trainer suggested a trip to the pediatrician the next day to possibly get an MRI. In the ensuing days and months Daniel further acknowledged he had been hit head-on and taken quite a few blows that left him seeing stars. The previous week alone, Daniel never told anyone – the coaches nor his parents – how many times he got clocked in the head, was sick, dizzy, and had headaches. A Tylenol here and there was all he asked for. In the following 19 months Daniel underwent every imaginable medical test: MRIs, MRAs, EEGs, and CT scans multiple times as a course of regular treatment, in the hospital, and even during an emergency room visit. He was seen by medical experts and specialists that looked at and tested his balance, ears, eyes, even his skin. Diagnosed with Post-Concussion Syndrome and ‘migraine-type headaches,’ Daniel regularly saw a neurologist, was on anti-seizure/migraine medication, visited a chiropractor, and even tried acupuncture. Nothing helped his chronic headaches, growing depression, sluggishness, and apathy. Daniel’s value judgments and behaviors deteriorated as he tried in vain to alleviate his pain through self-medication. Psychiatrists at one hospital prescribed anti-depressant and anti-psychotic medications geared to treat his depression, but they, just like all the numerous well-intentioned medical professionals in Broward County, never followed a process to also treat his injured brain. It wasn’t until March 2011 when Daniel was truly diagnosed and finally underwent treatment for his multiple football concussions 19 months prior. It was perchance a newspaper article on the Internet where I read about another young man with sports-related concussions from playing soccer and the neurologic and cognitive issues he and his family encountered. Within three months of his injuries, they found the UHealth Sports Medicine’s Concussion Program, and this young man was properly diagnosed, treated, and is thriving today. Since then the family partnered with the UHealth Sports Medicine’s Concussion Program, and the KiDZ Neuroscience Center at the Miami Project to Cure Paralysis and together made enormous strides to keep young athletes safe in all of Miami-Dade County’s Public High Schools through concussion awareness training and proper and immediate diagnoses. They established a protocol for monitoring all of Miami-Dade’s high school athletes before, during, and after an injury via ImPACT (Immediate Post-Concussion Assessment and Cognitive Testing); the first, most-widely used, and most scientifically validated computerized neurocognitive assessment. We need to implement ImPACT testing and more concussion education in other counties in Florida. Today we know, thanks to the doctors from University of Miami’s Concussion Program, Daniel indeed suffered multiple concussions and what Daniel suffered in totality for too long should never have happened. Daniel was an amazing young man, with a kind heart, a love for life, music, friends and family; and a zest for football. It is a parent’s worst nightmare to see their child suffer. It is as a result of a young man’s demise – why we need to not let it happen again, and why this is so important. Daniel took his own life in May 2011 as a result of the several disabilities resulting from his brain injury. Our family also now understands, disabilities resulting from concussions range differently for each person. Problems with thinking, memory, and reasoning as well as communication can be different from one athlete to another. If left untreated or under-diagnosed it can also lead to behavior and mental health issues such as depression, anxiety, aggression, loss of impulse control and value judgment. None of these issues can be diagnosed by MRIs, MRAs, EEGs, or CT scans. To start, neurocognitive testing such as ImPACT is needed for every one of our young athletes. Parallel to the required physical exam every athlete needs prior to playing sports, a neurocognitive baseline for post injury comparison is neither unreasonable nor unattainable. It provides parents and coaches a full awareness of the extent of the injury and is simply the best way to ensure our children are safe before returning to play after an injury. ImPACT is here and is available through awareness and School Board policies. 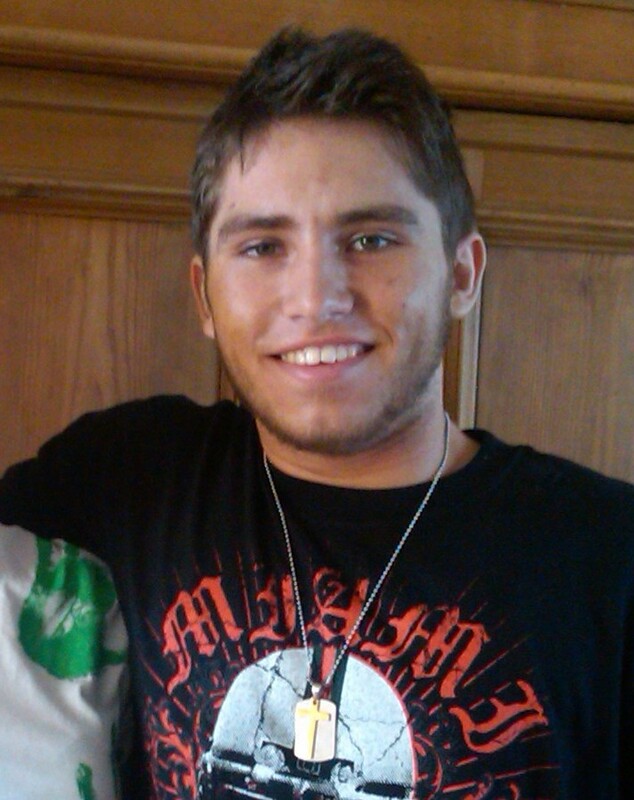 From March to May 2011, Daniel’s quality of life improved greatly due to the correct diagnoses and treatment by the doctors at the University of Miami’s Concussion Program. It was too late for Daniel for ImPACT or ongoing concussion management and education, but through countywide awareness and action, it is our hope his story can lead the way in other counties for ImPACT, concussion awareness, and integrated procedures to keep our kids safe. Finally, a standardization of protocols for our injured young athletes within each high school, pop warner, or optimist club needs to be addressed on behalf of these student athletes; so the worst-case scenario doesn’t play out again. Overarching policies in our communities and schools based on laws and proven processes for training, awareness, procedures, and testing is a must for concussion management. There is no excuse not to have it as this is not a watershed cause. With the support of some amazing people, The Daniel Brett Foundation met with School Board Member Ms. Laurie Rich Levinson, Broward County Director of Athletics and Student Activities Mr. Damian Huttenhoff and many others, and on March 20, 2012 the School Board of Broward County adopted a Resolution to provide a true Concussion Management Program for all Broward County public high schools. The Resolution now provides the mandatory implementation of neurocognitive testing (ImPACT) for every student athlete prior to participating in any sport to achieve a baseline through 2014; concussion awareness training countywide for parents, athletic trainers, students, and teachers; and follow-up guidance and services post-injury. Read more here. On March 31, 2012 The Daniel Brett Foundation sponsored the inaugural Daniel’s Dash for Concussion Awareness 5K Run/Walk! Supported by family, friends, community, and kind sponsors, over 400 runners and volunteers participated in the 1st (known anywhere) Concussion Awareness 5K Run/Walk at Markham Park in Sunrise, FL and it was a resounding success bringing true concussion education and awareness for all student athletes and parents in Broward County. Florida’s Concussion Law passed April 27, 2012! Spearheaded by a state task force led by Daniel’s doctor, Dr. Gillian Hotz, Ph.D., research professor of neurological surgery and director of UM’s Concussion Program, and sponsored by state Senator Anitere Flores of Miami, the law bars young athletes who endure concussions from returning to practice or play until they are cleared by a physician. It also requires parents to sign informed consent forms acknowledging they are aware of the risks of concussion. Daniel’s family and friends brought Daniel’s Story forward as a voice for more families to assist, and to support Dr. Hotz, the Goldstein Family, and many others already leading consciousness for concussion management protocols via Legislative change. On October 12, 2012 Governor Rick Scott visited The Miami Project to Cure Paralysis at the University of Miami to officially sign into law the bill designed to safeguard Florida’s youth athletes from the potentially devastating consequences of brain injuries suffered on the playing field. Thanking Dr. Hotz, and all of UM for its “admirable” work, Governor Scott dedicated the new law to Daniel Brett, a Broward County high school freshman who took his own life after enduring two years of long-term effects, including dizziness, mood swings and migraines, following multiple concussions playing football. His mother is now working with Broward Schools to bring baseline ImPACT testing and education to high school athletes. “This bill cannot bring Daniel back,” Scott said, “but it will live in his memory and hopefully protect the health and welfare of other students for generations to come.” Read more here. Finally, as the dangers and disabilities inherent with concussions become more apparent for both our younger and older athletes it is time to change the rules, to understand what can and will affect our kids in the future. The Boston University CTE Center notes: "Chronic Traumatic Encephalopathy (CTE) is a progressive degenerative disease of the brain found in athletes (and others) with a history of repetitive brain trauma, including symptomatic concussions as well as asymptomatic subconcussive hits to the head. CTE has been known to affect boxers since the 1920s. However, recent reports have been published of neuropathologically confirmed CTE in retired professional football players and other athletes who have a history of repetitive brain trauma. This trauma triggers progressive degeneration of the brain tissue, including the build-up of an abnormal protein called tau. These changes in the brain can begin months, years, or even decades after the last brain trauma or end of active athletic involvement. The brain degeneration is associated with memory loss, confusion, impaired judgment, impulse control problems, aggression, depression, and, eventually, progressive dementia." Read more about CTE from the BU CTE Center's website here. Shortly after Daniel died, he was included into the clinical study at Boston University CTE Center. CTE clinical researchers found athletes as young as 17 and 18 showing early signs of CTE caused by the kind of repetitive head trauma experienced on the field – similar to Daniel. The effect of Daniel’s brain injuries due to concussions were studied in Boston. Daniel was not found to have CTE – he was only 16 and a more in-depth study of his brain was not possible. What was found however was the build-up of abnormal tau protein in his brain tissue. We will never know if Daniel would have developed CTE, but looking forward, it is the asymptomatic subconcussive and successive hits to the head he experienced playing high school sports and the “return to play” issues stemming from those hits, that we hope to help address. See the wonderful things Concussion Legacy Foundation is doing through its Legacy Donor Program. Thank you truly for the continued support to me and my family and to all student athletes everywhere. 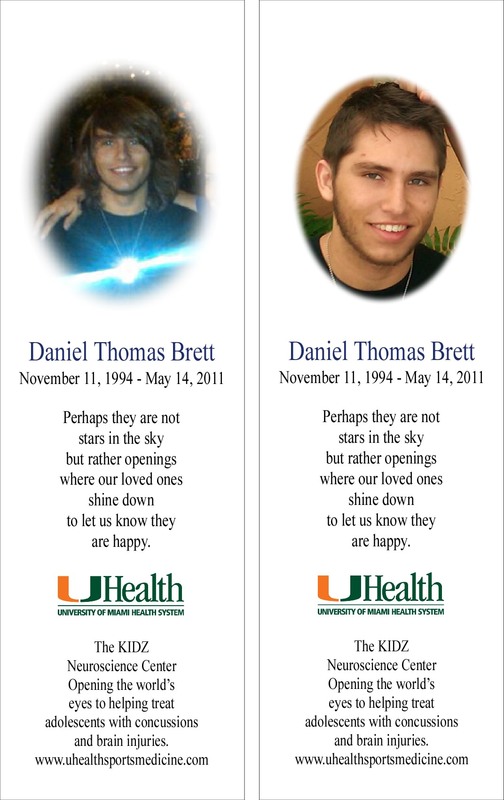 The Daniel Brett Foundation, Inc.
Daniel this is for you.